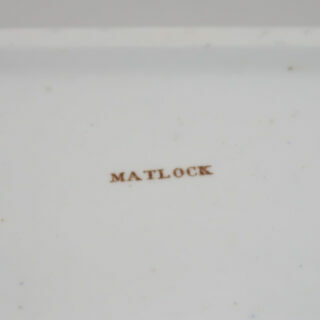 This version has a backstamp that says Matlock but this maybe the pattern reference rather than have anything to do with where it was made. 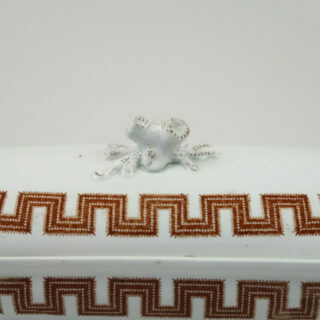 The lid is slightly ill fitting but the motif is lovely and the handle is in the form of some stylised coral. Would make a good receptacle for pens on a desktop. 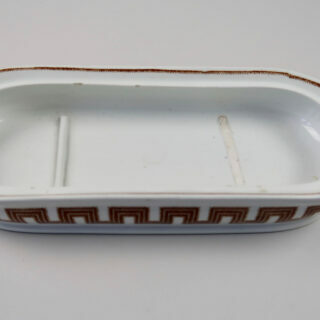 There are a few small nibbles to the body of the vessel and it has lost one of the internal ridges that would have held the toothbrush clear of the bottom of the bowl. 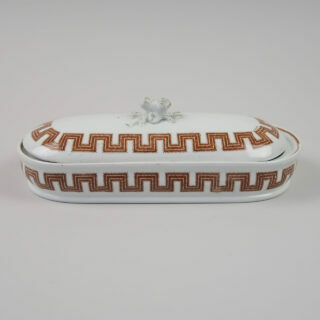 We have 2 other toothbrush holders – one with a green foliate design and another with a turquoise, gilt and floral decoration.